Do you hear that spooky rustling of the leaves outside your window? It’s artificial intelligence and machine learning, creeping around in the marketing woods like a Blair Witch comprised solely of ones and zeroes. 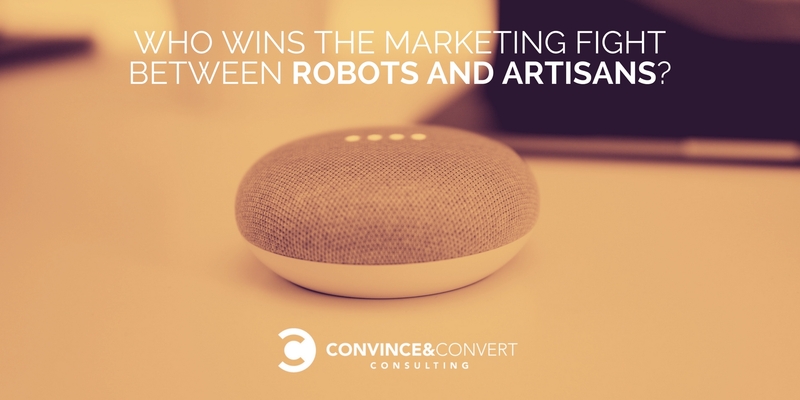 The story advanced by MarTech companies is that robot marketing assistants, powered by the big data gleaned from customers and prospects, will automagically create hyper-relevant landing pages, emails, social posts, display ads, push notifications, and all matter of digital communiqués. There are two benefits, they say. Because they use first-, second-, and third-party data, the resulting messages should be more palatable to recipients. Also, the labor necessary to create such finely targeted marketing executions falls to near zero (once you’ve paid your license fee) because the robots do the drudgery. This is inexorable and unavoidable, at some level. 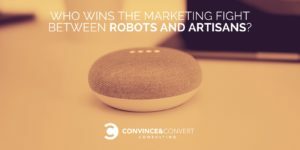 Unless we have a TOTAL and COMPLETE reimagining of data gathering and usage norms, artificially intelligent digital marketing will quickly come to dominate the landscape, especially in mid-sized and large organizations that need scale. It’s not dissimilar from the long-ago move from manual bid management in the paid search community to automated optimization and cultivation using software. In the fight for efficiency, robots remain undefeated. I’ve said in several podcasts and interviews that I’m generally fine with the advance of marketing AI because once the robots are doing the dirty work, the strategist becomes king. As a strategist myself, it’s not the worst outcome. If all competitors bring roughly the same knives to a knife fight, the knife strategist (I don’t think that’s an actual job) is the key, because the knife practitioners will cancel each other out (perhaps literally, in this tortured analogy). And ultimately, software can only execute on rules developed by human masters, right? We command the robot army, and it goes crazy with A/B testing and next best offer creation and such, until our prospect forks over their money. Humans still hold the steering wheel, because we’re the ones that have the ability to create and craft and curate and combine. We are artists in ways that AI never can be. There’s a an experimental new podcast about life in a fictitious town, from UC Santa Cruz PhD student James Ryan, written and “voiced” entirely by Sheldon, an artificial intelligence platform he created. Based on listeners’ habits and storytelling “threads” uncovered by the machine, each episode of the Sheldon County show is imagined and produced entirely by a robot. The prototype shows are available now on Ryan’s Soundcloud. The next iteration of the technology is that every listener will receive an entirely different story in each episode, developed and created on-the-fly by the SHELDON system. It would, of course, be impossible for me to record 50,000 different versions of my SocialPros podcast for each listener. But Ryan’s robot can do this with relative ease, once he completes the programming to do so. Holy cow, this is amazing. If we can train robots to be storytellers, what does that mean for the myriad human creators who use their skills to make stuff we enjoy, whether it’s “art” or “content” or something in between? What really shook me up was the juxtaposition between the Sheldon County podcast and the work of Michael Breach, an exceptionally talented barista artist I met at an event in January. Michael creates works of art using latte foam, including a human-powered magic trick where he paints your portrait while you wait, like one of those boardwalk caricaturists, but with more caffeine and a far less forgiving medium. Transfixed, I watched Michael work for nearly thirty minutes. A true artisan, he works with a tiny brush, pushing and pulling colored foam around a cup of real coffee. Could someone create a latte robot that could spit out a facsimile of Michael’s work, and do so faster and less expensively? Almost assuredly. But doing so squeezes every drop of joy and wonder out of the affair, and replaces it with expediency and efficiency. I can make a business case for the robots doing it all in marketing and creative: strategy, operations, execution and all the rest. But the emotional case? I’d prefer to keep riding with artisans like Michael Breach as long as possible. I’m really not sure if we’re aligned on this. Are we? I’d love to talk about it on LinkedIn, where this article is also posted.